There is emerging evidence linking obstructive sleep apnea (OSA) to vascular disease, including hypertension. This relationship may be independent of co-morbidity, such as obesity. Even apparently healthy OSA patients have evidence of subtle functional vascular abnormalities that are known to occur in patients with hypertension and atherosclerosis. Untreated OSA may possibly contribute to the initiation and/or progression of pathophysiologic mechanisms involved in hypertension, heart failure, cardiac ischemia and stroke. This brief commentary will examine the evidence and mechanisms linking OSA to vascular disease. Our understanding of OSA has evolved from regarding it as an interesting and occasionally annoying social curiosity to the recognition that OSA may act through various mechanisms to increase morbidity and mortality . The health consequences of sleep apnea are especially evident in the cardiovascular system, where it is becoming increasingly apparent that untreated OSA may have direct and deleterious effects on cardiac and vascular structure and function. These effects may include subtle and subclinical impairment of normal homeostatic regulation, such as impaired baroreflex  and chemoreflex  functions, and elevated nocturnal blood pressure, in sleep apnea patients without any overt cardiovascular diseases. There is also evidence that untreated OSA may possibly contribute to the initiation and/or progression of pathophysiologic mechanisms involved in hypertension, heart failure, cardiac ischemia and stroke. The evidence and mechanisms linking OSA to vascular disease generally, and to hypertension and stroke in particular, are outlined below. OSA appears to be highly prevalent in the middle-aged general population, affecting 9% of females and 24% of males between the ages of 30 and 60 years . Hypertension is also widespread in the middle-aged and older populations. It is therefore likely that there would be considerable co-morbidity of OSA and hypertension. Nevertheless, a number of studies suggest that the extent of this co-morbidity is substantially greater than would be expected in the absence of any causal interaction between these disease conditions. In studies in dogs, simulated sleep apnea (achieved by intermittent and repetitive airway occlusion during sleep) resulted in increased blood pressure during wakefulness . A number of studies in humans have sought to determine the presence and extent of a causal interaction between OSA and hypertension, independent of frequently co-existing, and potentially confounding, variables common to both conditions (e.g. age, gender, body mass index, etc.). Davies et al. performed a comparison of 24 hour ambulatory blood pressure profiles of 45 untreated patients with OSA and 45 control subjects matched for the known confounding variables. Significantly higher diastolic blood pressures during both the night and day, and higher systolic blood pressures during the night, were observed in the OSA patients. The Sleep Heart Health Study, an observational and cross-sectional investigation, examined the association between sleep-disordered breathing (SDB) and resting blood pressure in more than 6000 middle-aged and older adults . These data suggest that SDB was independently associated with higher blood pressures. Specifically, the prevalence of hypertension (defined as a resting blood pressure = 140/90 mmHg or the use of antihypertensive drugs) was found to progressively increase with the severity of SDB. The interaction between blood pressure and SDB was present even after adjusting for body mass index, which predictably diminished the strength of the association. Overall, the odds of hypertension appeared to increase with increases in the apnea–hypopnea index in a dose–response fashion. Similar data were evident from work by Bixler et al. in a study of 1741 subjects . They found the strength of the association between SDB and hypertension varied with age, and was most marked in the youngest individuals, particularly those of normal weight. Perhaps the most compelling etiologic evidence was provided recently by data from the Wisconsin Sleep Cohort Study, which prospectively investigated the association between SDB and the subsequent development of hypertension at 4 years of follow-up . The presence of SDB at initial evaluation was accompanied by a substantially increased risk for future hypertension. This relationship was present even after adjusting for other potential confounding variables and exhibited a dose–response relationship. For subjects with an apnea–hypopnea index = 15 events per hour, the risk ratio for developing new hypertension over a period of 4 years was increased threefold as compared with those without any nocturnal apnea. Effective treatment of OSA may result in lower blood pressure in hypertensive patients, particularly when blood pressure is measured over 24 hours [10,11,12], hence incorporating the effects of nocturnal blood pressure lowering. The blood pressure lowering effects of continuous positive airways pressure (CPAP) therapy, especially for daytime blood pressures, are less clear in normotensive subjects, as will be discussed later. An important earlier study from Palomaki et al. of 167 men with stroke noted that about one third experienced their strokes during sleep . They further demonstrated that only snoring was significantly related to stroke in sleep. Palomaki subsequently reported that the odds ratio of snoring as a risk factor for stroke was strongly increased if snoring was accompanied by excessive obesity and daytime somnolence . Additional data supporting the association between stroke and OSA have emerged since these earlier studies . Indeed, OSA has been implicated as a risk factor for first stroke, recurrent stroke, and post-stroke mortality. During sleep, repetitive episodes of airway occlusion, with consequent hypoxemia, hypercapnia and dramatic changes in intrathoracic pressure, elicit a wide variety of autonomic, hemodynamic, humoral and neuroendocrine responses. These responses themselves evoke acute changes in cardiovascular function, as well as more sustained effects that carry over into the daytime even when breathing is normal. First, hypoxemia and hypercapnia result in chemoreflex activation with consequent increases in sympathetic vasoconstrictor traffic to peripheral blood vessels  (Fig. 1). This reflex response results in striking increases in blood pressure as well as increased levels of circulating catecholamines. The sympathetic activity and surges in blood pressure are markedly attenuated by effective treatment with CPAP therapy . Stradling et al. reported that both nocturnal desaturations and respiratory effort (indirectly measured using pulse transit times) were significant independent predictors of an increase in blood pressure between night-time and morning . 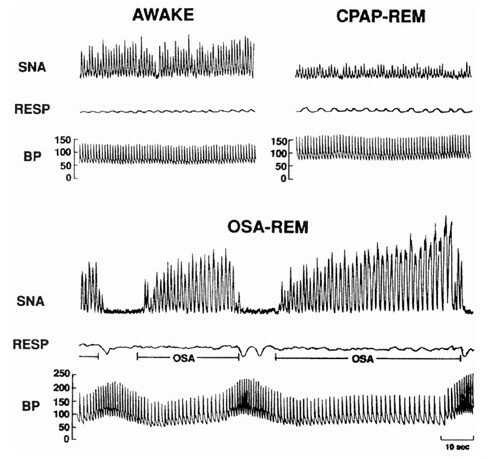 Recordings of sympathetic nerve activity (SNA), respiration (RESP) and intra-arterial blood pressure (BP) in the same subject when awake (top left), with obstructive sleep apnea (OSA) during rapid eye movement (REM) sleep (bottom), and with elimination of obstructive apnea by continuous positive airways pressure (CPAP) therapy during REM sleep (top right). SNA is very high during wakefulness, but increases even further secondary to OSA during REM. BP increases from 130/65 mmHg when awake to 256/110 mmHg at the end of apnea. Overall, nocturnal blood pressure is increased. Elimination of apnea by CPAP therapy (top right) results in decreased sympathetic traffic and prevents BP surges during REM sleep. Reproduced with permission from . While sympathetic activation is one mechanism that may contribute to increased daytime blood pressures after repetitive nocturnal apneas, a second possibility is the pressor effect of endothelin . Hypoxemia results in increased levels of endothelin production . Endothelin is a potent vasoconstrictor. In untreated patients, 4–5 hours of repetitive nocturnal apneas results in significant increases in both endothelin and blood pressure. Treatment of the OSA over the subsequent 4 hours dramatically reduces both blood pressure and endothelin levels when the subject is awake  (Fig. 2). Since endothelin has sustained hypertensive effects that persist for a number of hours, hypoxemia-mediated endothelin release during sleep may result in sustained daytime blood pressure elevation in patients with obstructive apnea. 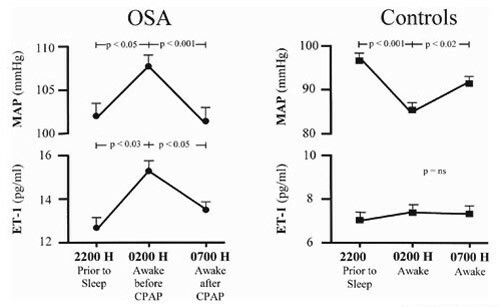 Comparison of mean arterial pressure (MAP) and endothelin 1 (ET-1) in 22 patients with severe obstructive sleep apnea (OSA) before sleep at approximately 22:00 hours, before nasal continuous positive airways pressure (CPAP) therapy at approximately 02:00 hours, and on waking at approximately 07:00 hours after 5 hours of CPAP therapy. Measurements in control subjects without sleep apnea are shown on the right. Data are means ± SEM. Reproduced with permission from . A third potential contribution to vasculopathy in OSA is endothelial dysfunction. The endothelial cells lining blood vessels are the source of endothelin production. These cells also produce a vasodilating substance, nitric oxide. The ability of the endothelial cells to generate nitric oxide in response to acetylcholine infusion provides an index of endothelial function. Impaired endothelial function is characteristic of hypertension  and atherosclerosis , and may theoretically also result from the repetitive hypoxemia and pressor surges evident in patients with OSA. Indeed, in awake patients with OSA, in the absence of any other disease state or potential cause for endothelial dysfunction, the endothelium-mediated vasodilator response to intra-arterial acetylcholine was markedly impaired in comparison with closely matched subjects without OSA . Subtle vascular abnormalities such as impaired endothelial function in seemingly healthy patients with OSA may thus predispose to the future development of hypertension and vascular disease. Other subclinical abnormalities in cardiovascular regulation in OSA patients include derangements in cardiovascular variability, a fourth possible mechanism for cardiovascular disease in OSA. Seemingly healthy OSA patients studied when awake and breathing normally in the daytime have clear-cut decreases in heart rate variability and increased blood pressure variability . Heart rate variability is markedly reduced in patients with heart failure, and in patients after myocardial infarction [26,27]. Decreased heart rate variability in patients with idiopathic dilated cardiomyopathy independently predicts the risk of cardiac death or heart transplantation . Depressed heart rate variability after myocardial infarction is a powerful prognostic indicator for both arrhythmia and death . Increased blood pressure variability in hypertension is linked independently to target organ damage . The depressed heart rate variability and increased blood pressure variability in patients with OSA, who appear to be otherwise healthy and free of any overt cardiovascular disease, may thus predispose to the future development of clinically significant cardiovascular dysfunction. Neural and humoral responses to night-time apnea result in increases in night-time blood pressure. This response to apnea may contribute in part to the phenomenon widely described as 'non-dipping'. Hypertensive patients whose blood pressures either do not decline or actually increase during the night appear to be at increased risk of cardiac and vascular events in comparison with similarly hypertensive patients whose blood pressures fall appropriately during the night . Undiagnosed OSA may contribute to the absence of a nocturnal blood pressure fall, as a consequence of the pressor effect of apnea. In a randomized, placebo-controlled trial of CPAP therapy in normotensive OSA patients, the greatest fall in blood pressure was evident when patients were asleep, without any substantial blood pressure reduction during wakefulness . These data are consistent with other studies in normotensive patients, which showed no significant change in daytime blood pressure after sustained CPAP therapy . Nevertheless, because even modest blood pressure declines may be linked to significant improvement in outcome, it is possible that some vascular benefit can be gained from the nocturnal blood pressure reduction. Furthermore, subtle abnormalities in neural and humoral measures of circulatory control in untreated sleep apnea may conceivably be attenuated by effective therapy, and the progression to overt cardiovascular disease may be halted or slowed. OSA is widely prevalent and is increasingly being linked to cardiac and vascular disease. Even seemingly healthy patients with OSA, without any evidence for overt cardiovascular disease, have subtle but very significant abnormalities in vascular regulation at several levels, including the neural, humoral and endothelial levels. These abnormalities may act to overcome even redundant vasoprotective mechanisms, hence predisposing to the future evolution of clinically significant functional and structural vascular changes that may present as hypertension and/or stroke. Effective treatment of OSA helps lower blood pressure in hypertensive patients and may lower nocturnal blood pressure in normotensive patients. These blood pressure changes may themselves have significant beneficial epidemiologic implications. The authors appreciate the expert assistance of Debra Pfeifer in typing this manuscript. Dr Somers is an Established Investigator of the American Heart Association. The authors are also supported by NIH grants HL65176, HL61560, R03 TWO 1148 and M01-RR00585.